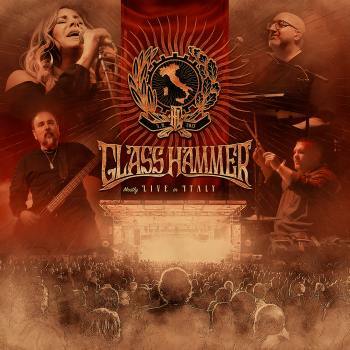 Glass Hammer has already released several live albums in their career. Another one can be added to them and got the title Mostly Live In Italy. You may ask yourself why it is named that way. Mainly because he band itself describes Mostly Live In Italy as partly live and partly a studio creation. The live material was edited and especially the guitar parts were replaced. The backing tracks as well as keyboards and vocals were recorded during the live performance in Veruno, Italy on September 2, 2017. In the local studio there was then a processing with overdubs. The guitars were all re-recorded. Whether this is due to the departure of guitarist Kamrah Alan Shikoh, who probably did not want his recordings to be used, remains a mystery. In any case, Fred Schendel has recorded these again. Mostly Live In Italy is most of all based on the latest studio work Valkyrie (2016, see review), that was performed in full length except for the title track. It then follows a medley of Chronos Deliverer and If The Sun and the classic Hyperbole, which had to serve as an encore. I was rather curious how they did manage to play the music of this masterpiece in front of the audience of the 2Days Prog + 1 Festival in Italy. Because the album brought them back to where they belonged. Being America's leading progressive rock band. The live album starts with a short orchestral intro before the band gets on stage and starts playing. Right from the starts after hearing the first few bars of The Fields We Know you know it's going to be OK! The song starts with crisp bass parts played by Steve Babb (bass guitar, bass synthesizer, bass pedals, lead and backing vocals). The Hammond organ played by Fred Schendel (keyboards, guitars, lead and backing vocals) swirls from the speakers, the keyboards are buzzing and there are nice guitar solos as well. Drummer Aaron Raulston does a great job on this opening piece as on the rest of the live material. Throughout the entire live album it is most of all female lead singer Susie Bogdanowicz who shines all the way by doing a perfect vocal performance. Copying perfectly the original vocal parts of current Yes singer Jon Davison as doing perfectly her own parts of the band's latest studio album. She is one of the best and most convincing female singers in the prog- scene without any doubt. I am not going into details how every track sounds, but believe me each member does an outstanding job in giving most of all Valkyrie a more aggressive and vivid live version. Not as clean as on the studio album. More energetic and raw so to speak. Just how I like it on a live album. Not just copying the studio version. But still no matter which instrument they bring to their music, it is always skillful and suitable. The compositions are good, imaginative and varied, the production is full and juicy, the sound is never overburdened. The instruments are neatly staggered and separated. I guess I do not have to say many words about the music Glass Hammer delivers on this fantastic release. They sure do not do anything new, everything is familiar, usual good and therefore they still belong to America's leading live bands. They prove it here one more time. Even if the guitar parts are rerecorded in the studio. All in all, this is a decent, if not outstanding, live album. Mostly Live In Italy reveals itself on closer inspection as a real jewel which will not only be loved by fans of the band but by progressive rock lovers in general! Because this is how a live album should sound! I guess it can't be done any better! Well done indeed.